Fourth Row Center: Film Writings by Jason Bailey: On DVD: "Nowhere Boy"
The story of John Lennon’s formative years has been told so many times—both in documentaries (Imagine: John Lennon, The Beatles Anthology, The Compleat Beatles) and fictionalized docudramas (Backbeat, The Hours and Times, The Birth of the Beatles), to say nothing of countless written biographies—that there’s some question as to what exactly director Sam Tayler-Wood hopes to add to the mythology with his new film Nowhere Boy. But she finds a fresh take on the material, primarily by focusing on the sticky three-way dynamic between Lennon and the two women who raised him—and how those relationships made him the man he became. 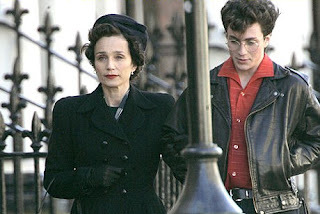 "Nowhere Boy" hits DVD and Blu-ray on Tuesday, January 25th.